Although Arnel Pineda became Journey’s new lead singer six years ago, many fans still haven’t experienced his marvelous live interpretations yet. That was obvious at the Hollywood Bowl on Friday night. When the veteran rock band opened its solid 90-minute, 16-song set with “Be Good to Yourself,” a bunch of partying concertgoers in the box seats couldn’t stop exclaiming how good Pineda was. Loud praise for the YouTube discovery (as documented in last year’s DVDDon’t Stop Believin’: Everyman’s Journey) conitnued later from others nearby. Having recorded two studio albums with Journey (2008’s Revelation and 2011’s Eclipse) and completed countless world tours, the Manila native has found a comfortable medium between Steve Perry’s original intonations and his own style, even if that meant an occasional unintelligible phrasing or two during this L.A. stop on a tour that returns Aug. 2 at Verizon Wireless Amphitheater in Irvine. Pineda and founding guitarist Neal Schon have kept busy lately beyond the band, contributing a cover of the Police’s “Synchronicity II” for a coming charity album to help combat human trafficking. Schon – who married Michaele Salahi ofThe Real Housewives of Washington D.C.last December during a live pay-per-view wedding – also has a solo album (“So U”) due Tuesday via Frontiers Records. It features Journey drummer Deen Castronovo and songs co-written by Jack Blades of Night Ranger. This new tour with Steve Miller Band and Tower of Power, which began Thursday in San Diego, is unofficially called the “Sounds of San Francisco.” All three Bay Area groups formed between the late ’60s and early ’70s but had never undertaken a cross-country jaunt together. They share some common threads: Back when Schon was in Santana, he jammed around town with the other musicians, while Journey bassist Ross Valory was previously in Miller’s group. Schon and Miller did live dates behind Paul Rodgers’ 1993 tributeMuddy Waters Blues. And, of course, Journey and Miller have two of the best-sellingGreatest Hitscollections of all time. Surprisingly, Journey didn’t make use of the semi-circular ramp that divided the general-admission pit area and box seating. And though Schon and Miller have said guesting during each other’s sets may be possible, nothing materialized at this sold-out show. Pineda wasted no time mixing things up with fans, and at 46 he’s remarkably nimble, leaping and splitting like a gymnast half his age. The hard-hitting thrust of “Separate Ways (Worlds Apart)” saw the frontman slap high-fives between vocal wails. Schon’s piercing guitar solo amid “Any Way You Want It” also drew a rousing response. Despite a muddy sound mix at times, quieter dramatic ballads like “Send Her My Love,” “Faithfully” and “Open Arms” gave Pineda a better chance to shine. Keyboardist, rhythm guitarist and co-songwriter Jonathan Cain prefaced the latter with an orchestral-tinged Journey suite. The ubiquitous hit “Don’t Stop Believin’” expectedly brought the house down to close the main set, and an extended “Lovin’, Touchin’, Squeezin’” capped the concert with a fun singalong. 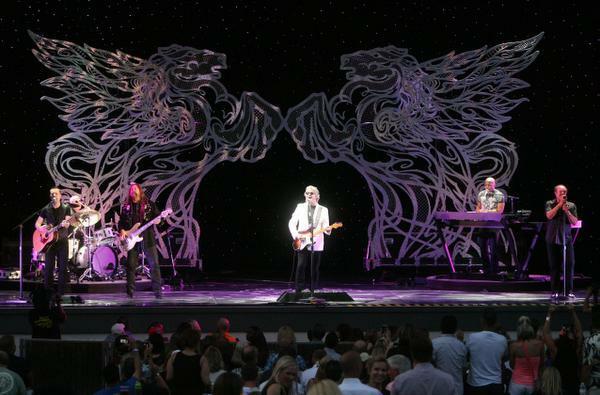 The Steve Miller Band performs at the Hollywood Bowl on Friday. ///ADDITIONAL INFO: 08.journeymiller.0517.ab – shot 05/16 – ARMANDO BROWN, CONTRIBUTING PHOTOGRAPHER – Journey and the Steve Miller Band at the Hollywood Bowl. Rollicking electric piano by Joseph Wooten made “Take the Money and Run” an early highlight. Backing singer and dancer Sonny Charles, known for minor R&B hits in the ’60s and early ’80s, took a break from his soft-shoe routine to handle lead on a cover of Louisiana blues artist Jesse Hill’s 1960 nugget “Ooh Poo Pah Doo.” Miller’s solo acoustic segment – “Dance Dance Dance,” “Wild Mountain Honey” and “Gangster of Love” – were folksy delights that impressively held the drunken crowd’s attention. Noting the recent 40th Anniversary ofThe Jokerand a new self-released concert recording of it, Miller and the band kicked everything up a few gears with a vibrant run through its title track. A soaring “Swingtown,” propulsive “Rock’n Me” and “Jet Airliner” and the spacey, laid-back encore, “Fly Like an Eagle,” had the audience frenzied by the end. The band’s five-piece horn section was especially sharp during the percolating funk of “Soul Vaccination,” heard on last year’s archival release “Hipper Than Hip.” TOP’s “So Very Hard to Go” (a Top 20 pop hit in ’73) brought back childhood memories of listening to Art Laboe on KRLA-AM.